The K-Bar cane was the first aluminum model we promoted at ACSD. When TDI could no longer supply the demand and we had customers waiting, I had no choice but to fulfill that demand by going a step further and making improvements to the K-Bar model. We not only listened to what customers were saying, but on our end, there’s only one way to the truth in anything we offer: TESTING. 2. 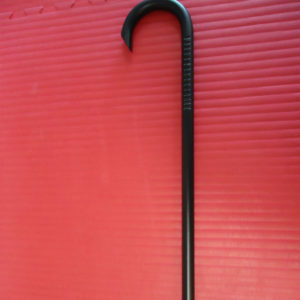 Non functional, abrasive grips: Anything added to a self defense cane should either improve maneuverability or have the potential for a quicker release response from your assailant. The Ka-Bar cane grips are non-functional in close quarters and even worse, can literally rip chunks of skin from your hands if you really train with it. Cane figure eights to ward off an attacker with the K-Bar? Make sure you’re wearing gloves. SOLUTION: The Raven features two sets of etched grips designed to improve maneuverability and rake opponent’s hands and limbs, not yours. 3. Crook too wide/soft Horn: What makes the cane a legal self defense tool you can carry anywhere is the horn and crook. Yet most cane self defense practitioners do not know how to use it effectively for self defense. The only time you want a wide horn is if you’re an instructor who doesn’t want to hurt your student or assistant when you demo. For the bad guy, you want something that will “catch and drag” the neck, limbs, groin and pressure points. Believe me, you don’t want it to fit nicely around the neck. SOLUTION: The Raven features a tighter crook and sharper horn designed to catch and drag without calling attention. We still get it through airport security all the time. Aesthetic Shortcoming of the K-Bar: The main complaint here was the cane would chip easily. For those of us who were mainly interested in self defense, we could care less. We learned however, that customers were attracted to the sleek black design and didn’t want the cane chipping from putting it in their grocery cart. (Yes, we actually had this complaint.) SOLUTION: The Raven is powder coated. End of story. If you bang it continuously it may chip. It will not chip however, if you left it leaning against your car and it fell (shame on you!) as the K-bar version does. One word on the “indestructibility” of either cane. 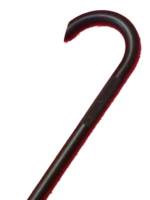 I’ve read reviews on the K-Bar and have to laugh when I hear how indestructible the cane is. These reviews are coming from well intentioned folks who do not cane train. Neither the Raven or K-bar should crack, so in that sense, it’s “indestructible”. However, they will both bend under repeated duress. Bending in combat is better than having it crack as is the case with hardwoods. See “The Robaina Raven vs. Hardwood Canes” post. Both canes could last a lifetime as long you’re not constantly “testing” its’ durability. Use the canes for what they were intended: self defense. If you want a cane to train with and bang around that won’t chip, get a Robaina Heavy or as several of our members have learned, get two Ravens, one for training and one for a night out on the town. Bottom line: The Robaina Raven is a superior self defense cane to the K-bar. It was designed by folks who specialize in cane self defense. 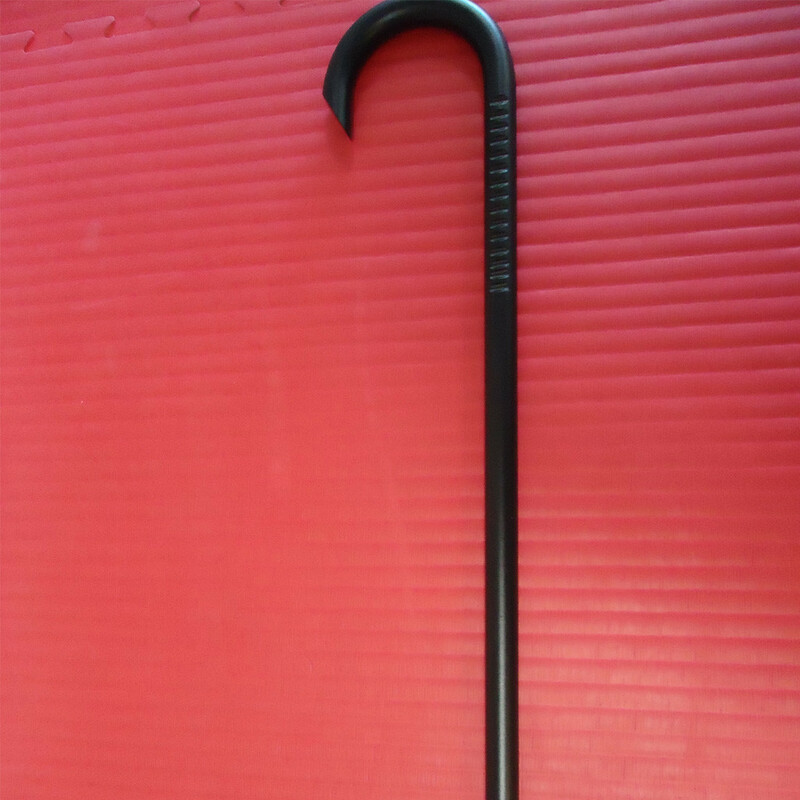 You could pick up a K-Bar cane for training and banging and have the Raven as your self defense companion. When you go from the K-Bar to The Raven it’s like going from driving a Ford Pick-Up to driving an Expedition Eddie Bauer Edition. Try it, I’m sure you’ll agree. Joe Robaina’s American Cane Self Defense system was primarily designed to defend against knife attacks. 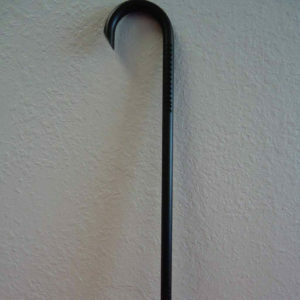 Today it has an international following with the Cane presented as a medical device that can save your life in a variety of self-defense scenarios. A practical tool of empowerment. American Cane Self Defense is tactical self defense SYSTEM that includes the use of the cane as well as empty hand translations. While other tools such as knives and chucks are regulated and controlled the cane is a medical device you can take anywhere you go and as a tactical self defense it's practical and effective.